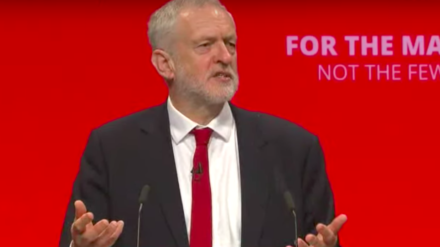 Jeremy Corbyn will vow to use technology to transform the economy when he delivers the keynote speech at Co-operative Party conference tomorrow. Our economy is failing to deliver for millions of people. The existing system is failing to deliver secure jobs, failing to deliver secure housing, and failing to deliver rising living standards for the majority. Yet this is the system, which exploits the many for the profits of a few, that the Conservatives want to defend. They are determined to protect the privilege of the few. The chancellor Philip Hammond says that Labour poses an “existential challenge to our economic model”. He’s absolutely right, we do. I am not going to sit back when their economic model allows homelessness to double, four million children to live in poverty and over a million older people not getting the care they need. The new consensus will reward the real wealth creators – that means all of us. It will genuinely value people and communities – and invest in them. It will create an economy fit for the 21st Century, with a state that’s not afraid to act when something goes wrong, but also takes action to make sure things work in the first place. New technology opens the door to far greater participation. New social movements today are horizontal rather than hierarchical, networked rather than top-down. That’s why when I ran to be Labour leader I said I wanted our party to be a movement. The top-down model of organisation – whether in politics, the media or in business – is being challenged and is breaking down. The technology of the digital age should empower us both as workers and consumers, allowing us to co-operate on a scale in a way that wasn’t possible in the past. And yet too often it has given rein to a more rapacious and exploitative form of capitalism. Look at Uber, Deliveroo and other new masters of the gig economy. The platforms these companies use are the technologies of the future. But too often their business models depend not on technological advantage, but on establishing an effective monopoly in their market and using it to drive wages and conditions through the floor. Digital platforms are opening up huge opportunities for horizontal, more democratic forms of organisation to flourish. Imagine an Uber run co-operatively by their drivers, collectively controlling their futures, agreeing their own pay and conditions, with profits shared or re-invested. The biggest obstacle to this is not technological, but a rigged economic system that favours wealth extractors not wealth creators. That’s why we commissioned our report on Alternative Models of Ownership to start asking fundamental questions about who should own and run our economy in the digital age, and how to ensure that its enormous potential benefits serve the many, not the few. To prevent the “rise of the robots” benefiting only a powerful and wealthy few, the report suggests a higher minimum wage, shorter working week, profit sharing schemes or putting the ownership and control of the robots in the hands of those who work with them. We don’t claim to have all the answers, but are thinking radically about how we can use the power of new technology in the coming decades to make our economy work for us all. To build a new high-investment economy for the 21st century, we must get Brexit right. That means securing full access to the Single Market and using the powers we get back from Brussels to help transform our economy. With each passing day they are driving us closer to a no deal Brexit. Let’s be clear: no deal is the worst possible deal. It would leave us with World Trade Organisation tariffs and restrictions instead of the full access to European markets we need. The risk would be that key manufacturers leave for the European mainland, taking skilled jobs with them. In sector after sector, ‘no deal’ could prove to be an economic disaster.